Tatiana Akhmetshina made the report “Nanocluster model and its application for crystal structure prediction of complex intermetallics” at the session “Combined approaches for structure characterization of modulated and complex structures”. She talked on current results of prediction of intermetallic structures with the application of nanocluster analysis method implemented in ToposPro. Tatiana has got one of two special grants of the European Crystallographic Association for participation in the conference. Eugeny Alexandrov contributed to the session “Topological analysis of structures: algorithms and software” with the report “Complex approach to analysis of crystal structures based on unified topological model” reviewing topological and geometrical approaches to the analysis of porous MOFs developed in SCTMS. Prof. Vladislav Blatov and Prof. Patrick McArdle (Ireland) chaired the session. Dr. Senja Bartel (EPFL, Switzerland) and Dr. Matthew Addicoat (Nottingham Trent University, UK) who conduct joint researches with SCTMS scientists also participated in the session. On August 25, Prof. Vladislav Blatov conducted the workshop “Topological analysis with ToposPro and TORIS” within the session “Crystallographic Fayre”; about 40 participants attended the workshop. The participants were acquainted with ToposPro capacities for determining topology of crystal structures and with the software and databases employed in a new web-service TORIS. “Our participation in major crystallographic symposia becomes more and more recognizable and versatile, - Prof. Blatov comments. – I would like to notice that our young researchers are regularly invited to prestigious conferences with oral reports. Not least important is that we establish new scientific contacts at such conferences. 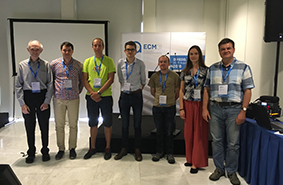 At the current ECM31 we agreed to accept colleagues from Moscow and Rostov-on-Don for an internship at SCTMS and to conduct joint research”.